ROCKVILLE, Md., March 28, 2017 /PRNewswire/ -- Federal Realty Investment Trust (NYSE: FRT) announced today its exclusive partnership with Freight Farms, a Boston-based company that retrofits shipping containers with vertical farming technology capable of growing acres' worth of produce in a fraction of the space of traditional farms. The partnership empowers anyone to use this technology while repurposing Federal Realty's unused parking spaces as a place to locally and sustainably produce food that benefits the shopping centers' tenants, customers and community. "Freight Farms is thrilled with the opportunity to offer our customers the ability to operate in some of the best locations in the country," said Caroline Katsiroubas, Freight Farms' marketing director. "Finding the right location is a major hurdle for most new farmers. By partnering up with Federal Realty, we are eliminating a large barrier to entry for individuals looking to grow fresh produce for their local communities." Federal Realty will begin offering parking spaces for rent to freight farmers at select shopping centers across the country. Each property will offer a unique set of benefits, from opportunities to partner with restaurants and grocery stores to increased brand awareness and local marketing initiatives. "Federal Realty is committed to minimizing and reducing environmental impact not only through sustainable development and operations, but through strategic partnerships that bring value to the communities we serve," said Chris Brown, Federal Realty's director of sustainability. "We are thrilled that we can provide future farmers with an environment where their new businesses can thrive." Federal Realty and Freight Farms will be rolling out this program in strategic locations, with the first farm anticipated to begin operating this spring. Both look forward to expanding the partnership nationwide empowering more individuals to sustainably grow fresh produce in their communities year-round. Freight Farms provides physical and digital solutions for creating local produce ecosystems on a global scale. The company's flagship product, The Leafy Green Machine, is a complete hydroponic growing system capable of producing a variety of lettuces, herbs and hearty greens. Assembled inside an upcycled shipping container, the pre-built system includes all necessary components for commercial food production and enables any individual, community or organization to grow fresh produce year-round, no matter their background or climate. Leafy Green Machines can be monitored in real-time from any location and users can purchase growing supplies directly from their mobile devices. Launched in 2010, Freight Farms is eliminating the negative effects of large-scale food production and distribution by creating year-round, sustainable access to local, fresh produce in any environment. 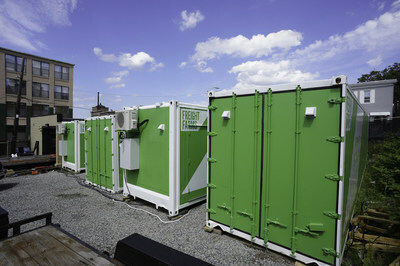 For more information, please visit www.FreightFarms.com.